Turkey's "Sun of the Age"
Originally published under the title, "Turkey's 'Muslim God'." Turkey is probably one of the best social laboratories in the world to prove why Islamist ideology cannot be compatible with a culture of humor, dissent and protest. It also offers a unique experience that shows how Islamists can even violate one of their religion's most fundamental teachings for the sake of worshipping a leader's cult of personality. 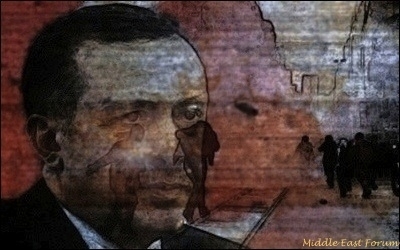 At a parliamentary session in February, Turkish deputies gathered to debate a controversial security bill. Instead of debate, a brawl broke out. The session ended after five MPs were taken to the hospital. That bill, sponsored by the government but fiercely rebuked by the opposition, has just taken effect, adding to fears that Turkey is fast becoming a police state. For instance, the new bill gives the police the right to detain a person if they deem the situation in flagrante delicto (while the crime is blazing). The suspect can be kept in custody for 24 hours without seeing a judge -- and 48 hours if the police suspect "collective crime." A police chief can now order a strip search or a car search without a court-issued warrant. The new law grants the police the ability to wiretap anyone for intelligence gathering without a court order. The police now have the authority to use firearms against protesters who "use or attempt to use Molotov cocktails, as well as explosives, inflammables, incendiaries, suffocating devices, or injurious or similar arms." With the new law, slingshots, iron pellets and fireworks are classified as arms, and their use in demonstrations constitutes a crime punishable by up to four years in prison. If protesters wear the emblem, sign or uniform of an illegal organization, they can get up to three years in jail. Just covering one's face partly or fully during a demonstration can now bring up to five years in prison. Finally, the new law grants the police the ability to wiretap anyone for intelligence gathering, also without a court order. "Political scientists often describe Turkey under Mr. Erdogan as a noncompetitive democracy, in which opposition parties still exist and regular voting occurs but the institutions of freedom have been hollowed out. The uptick in repression that began in late 2013 suggests Mr. Erdogan would like to go further than that," said an editorial in the Wall Street Journal last month. Indeed, dissent is an increasingly risky engagement in Turkey. In February, the Vienna-based International Press Institute's (IPI) Turkish National Committee said that it would launch a campaign against the increasing number of defamation lawsuits targeting journalists in Turkey. The IPI's special report on Turkey warned that such suits and arrests threatened Turkey's democracy. More than 70 people in Turkey have been prosecuted for "insulting" Recep Tayyip Erdogan since he was elected President in August 2014. There were hundreds of similar cases during his term as Turkey's Prime Minister. Cartoonists Ozer Aydogan (middle) and Bahadir Baruter (right) received 11-month suspended prison sentences for drawing a cartoon (left) with "a hidden gesture insulting [President] Erdogan." 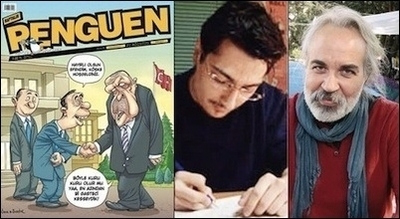 On March 19, two prominent cartoonists from a humor magazine, Penguen, received 11-month suspended prison sentences for drawing a cartoon with "a hidden gesture insulting Erdogan." Also recently, Yasar Elma, a journalist from a local daily in southeastern Turkey, received a suspended prison sentence for "liking" a remark criticizing Erdogan on Facebook, which the court deemed an "insult." The court originally sentenced Elma to 28 months but reduced it to 23 months before suspending it. Apparently, Erdogan and his followers believe that he is not just the "supreme leader" who cannot be criticized; there is an even more worrying side of literal worship to Erdogan among his pious supporters. In Islam, "shirk" is an unforgivable sin, as it constitutes polytheism. The Quran strictly bans any Muslim to associate human beings with God. Ironically, "shirk" is a popular pastime among Erdogan's devout Muslim fans. As Turkish columnist Mustafa Akyol reminded readers in a recent article, a government deputy declared in 2011 that "even touching Erdogan is a form of worship," and in 2014 another government deputy proclaimed that Erdogan "carries all the attributes of Allah in himself." Turkey looks more like Putin's Russia than any member of the European club it theoretically hopes to join. Akyol writes that a recent book, "Recep Tayyip Erdogan: The Sun of the Age," proudly refers to the president as "an idol for our youth," which would sound bizarre, if not heretical, to the average Islamist. "Such views, heretical from a traditional Islamic perspective, were criticized and ridiculed by Erdogan's opponents, but he conspicuously said nothing," Akyol comments. Erdogan, who has never hidden his appreciation for praise and rigid intolerance of criticism, may be happy for being portrayed as "The Sun of the Age," or by being associated with Allah. He probably believes that he possesses near-holy qualities gifted to him by Allah for the advancement of Islam as a political ideology, both in Turkey and in the former Ottoman lands. He may not be aware that he is merely ridiculing himself when his propaganda machinery, too, excessively pleases him with funny overdoses of praise. That would be just his problem. But then there are the casualties such as a judiciary, fully loyal to him, which carries out ugly witch-hunts against his opponents -- who number in the tens of millions. Each day Turkey looks more like Putin's Russia than any member of the European club it theoretically hopes to join.